Thinking like a marketer. It’s the secret to moving your organization from status quo to success story, from busy to profitable, and from mediocre to meaningfully different. 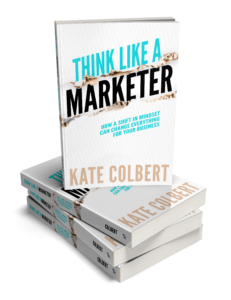 Think Like a Marketer: How a Shift in Mindset Can Change Everything for Your Business by renowned marketing expert Kate Colbert is an easy-to-read, practical new guidebook for business leaders. It offers fresh insights into the actions and attitudes that can accelerate your business success, sharpen your daily work, and balance your efforts to create value for customers while capturing value for the bottom line. For non-marketers and marketers alike, truly thinking like a marketer requires the right framework, and this book is everything you need to make the mindset shift that can change everything for your business. In its first days, Think Like a Marketer was ranked in the top 1% of all business marketing books on Amazon and was heralded as Amazon's #11 “hot new release” in its category. Contact Kate to learn about bulk discounts for your organization, guided book clubs for business leaders, and custom corporation editions of the book.to learn about bulk discounts for your organization, guided book clubs for business leaders, and custom corporation editions of the book.